Commercialized in the RG series in pursuit of the unparalleled fine expression and "real" in the 1/144 series! We thoroughly reproduce GN long rifle by new modeling according to RG! Reproduce faithfully with the detailed details unique to RG! ● Reproduce the distinctive armed "GN long rifle" with a new modeling based on RG! Completely reproduce the special arming corresponding to the covert sniper mission with new modeling. ・ Incorporates fine details unique to RG, and uses clear material for the sensor part. -Equipped with the folding mechanism of the body, it can reproduce both the deployment and storage conditions. It is also possible to attach to the forearm through the joint. ● Thoroughly reproduce the shape of Repair III body! Faithfully reproduce the exterior part of Repair III with new modeling. 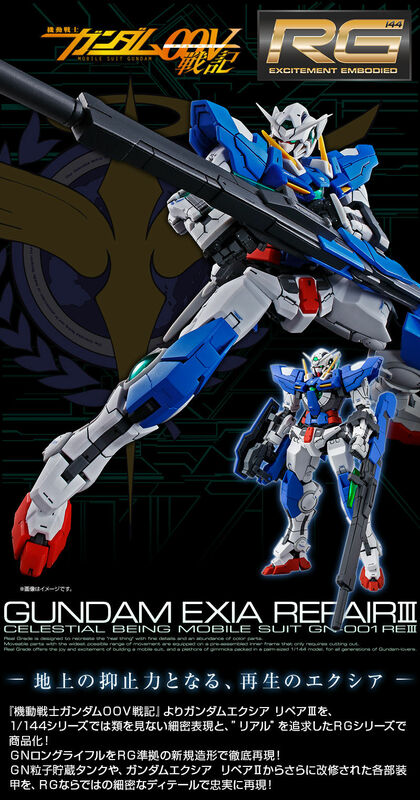 In addition to the changes with Gundam Exia Repair II, new shapes are created for each shape whose shape has been further changed with this machine. ● Realistic decals are included in the new design!